Affirmed and jockey Steve Cauthen won the Kentucky Derby on May 6, 1978, at Churchill Downs, and then went on to victory in the Preakness Stakes and the Belmont Stakes, thereby securing horse racing's ultimate prize, the Triple Crown. 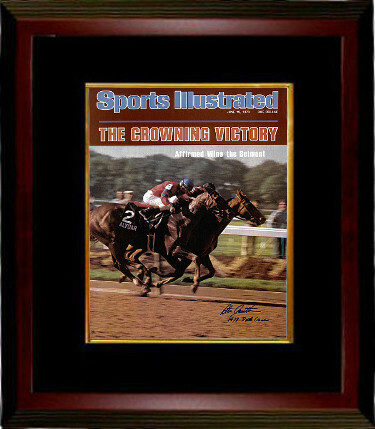 Steve Cauthen has hand signed this 16x20 Photo Belmont Sports Illustrated Cover from June 19, 1978 w/ 1978 Triple Crown inscription. Certificate of Authenticity from Athlon Sports Collectibles. Custom Black Mat and Premium Mahogany Frame as shown.